While traveling in Calgary, Alberto Manguel was struck by how the novel he was reading (Goethe's Elective Affinities) seemed to reflect the social chaos of the world in which he was living. An article in the daily paper would suddenly be illuminated by a passage in the novel; a long reflection would be prompted by a single word. 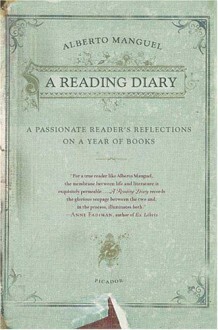 He decided to keep a record of these moments, rereading a book each month, and forming A Reading Diary: a volume of notes, reflections, impressions of travel, of friends, of events public and private, all elicited by his reading. From Don Quixote (August) to The Island of Dr. Moreau (February) to Kim (April), Manguel leads us on an enthralling adventure in literature and life, and demonstrates how, for the passionate reader, one is utterly inextricable from the other.